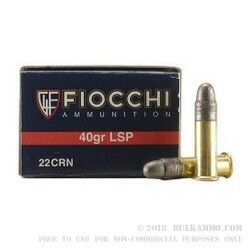 Fiocchi isn’t necessarily known for their .22 long rifle offerings, but maybe they should be, because their product is exceptionally well built and the price point for this .22 LR ammo is very nice. The reputation of Fiocchi from a production control perspective is quite good. They offer new, high quality ammunition that offers tight tolerances and very high reliability. 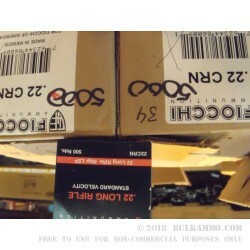 This rimfire ammunition seems to be no different. The low price point doesn’t preclude it from being very accurate, extremely reliable and offering an enjoyable shooting experience. Having another Fiocchi offering on the market gives consumers a better overall choice, and allows competitive pricing to take place more readily. It’s nice to see mature companies looking out for the consumer. Fiocchi is very good at doing this. Their all in-house component manufacturing and high quality production facilities produce great ammunition across the board. A great plinking round but offering accuracy that’s good enough for most target duties, this ammunition is a good all-around shooting cartridge to have on your shelf and the very good price point helps to justify that decision. This round is suitable for use in any firearm that can chamber the .22LR, and the velocity of 1070 feet per second at the muzzle exit makes to potent enough to cycle all types of guns.